I’m flying to Italy tomorrow night. I’ll be spending 3 nights in Milan, and then 3 nights in Rome, all to cover the Italian election. Why is the Italian election worth covering? Well for one thing, elections are always fun events. But for another thing, the election has big implications for Europe, and it basically all comes down to this chart. 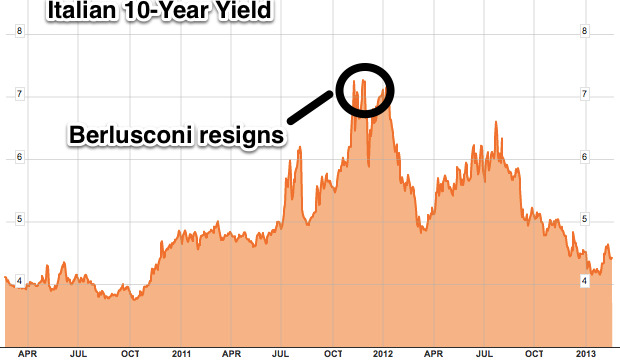 It’s the yield on the Italian 10-year bond, which peaked in late 2011, as the Euro crisis was raging. 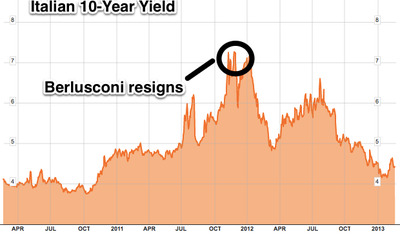 That peak coincided with the resignation of Silvio Berlusconi. Well, Berlusconi is trying to make a comeback, and though he’s not favoured to win, he’s more competitive than people expected at the beginning of the year. Basically, the government of Berlusconi’s replacement (Mario Monti) has been effective at getting borrowing costs down, and the type of stuff that bankers like. But unemployment is raging, there’s no economic upturn in sight, and the public is angry. In a nightmare scenario, establishment candidates lose big, populists win big, Italian borrowing costs soar, the ECB is forced to step in, the Germans are furious and all the progress that’s been made in recent months goes away. It may be a longshot, but it’s an interesting enough possibility that it’s worth paying attention to. So tomorrow I’ll be off to meet bankers, politicians, workers, and anyone else in Italy with a story to tell. If you’re going to be in Milan or Rome over the next week, email me: [email protected] and let’s meet up.